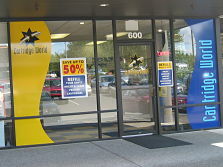 This Cartridge World store has been open since 2005 and has sales of $323,000. It is well located and borders Beaverton, which is the second largest city in Oregon. Current owners are selling as they wish to retire. There is a growing and longterm customer base in this solid business which has a huge market potential and good solid staff all in place. Perfect opportunity for a new owner to take over this profitable business and start doing business immediately.